- Simple, high-quality and fast convert Flash(swf) to Avi, iPod, iPhone, PSP, Zune, Apple TV, Nokia cellphone, Sony cellphone, DVD, VCD, SVCD, Audio CD, and other video, audio, images. g" one-step solution, you could easily convert and burn Flash(swf) to VCD, SVCD, DVD. 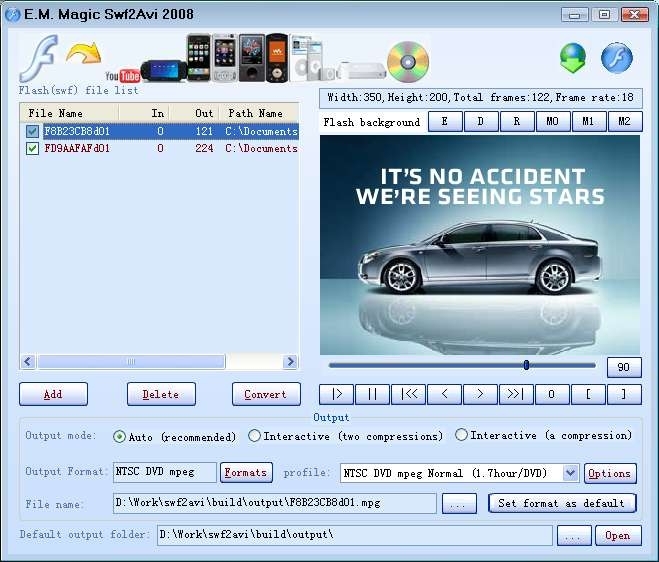 n addition, The Flash Converter provides an easy way to extract Flash(swf) file audio and convert to popular audio file, like MP2, MP3, AC3, WMA, WAV, FLAC, M4A, OGG, AAC, AU, MMF etc. The Flash Converter also can burn Audio CD. equences, TAG, TIFF, PNG image sequences with alpha transparent channel. , Motorola), Apple TV, iPhone, etc. io formats, like MP2, MP3, AC3, WMA, WAV, FLAC, M4A, OGG, AAC, AU, MMF etc..